We are adding two new materials to the list of items you can drop off at the Transfer Station Recycling Depot. Make sure the neck of the bottle or jug is smaller than the body of the container. Not accepted: Plastic tubs, clamshell containers, deli trays, container lids, buckets and plastic bags of any kind are not accepted, even if they have the #1 or #2 chasing arrows symbol. Remember, you have to check the neck. Flip the bottom or jug upside down and look for the chasing arrows symbol with a number stamped inside it. Working together, we can find recycling options. We have found plastics processors here in the Pacific Northwest who want bottles and jugs in #1 and #2 plastics. As long as we can collect these two types of plastic bottles and jugs separately, we can ship them directly to the mills, rather than to sorting facilities — which allows them to be recycled as close to home as possible. If plastic bottles and jugs with a #1 or #2 are recyclable, why can’t I throw them into my red-lid recycling cart? 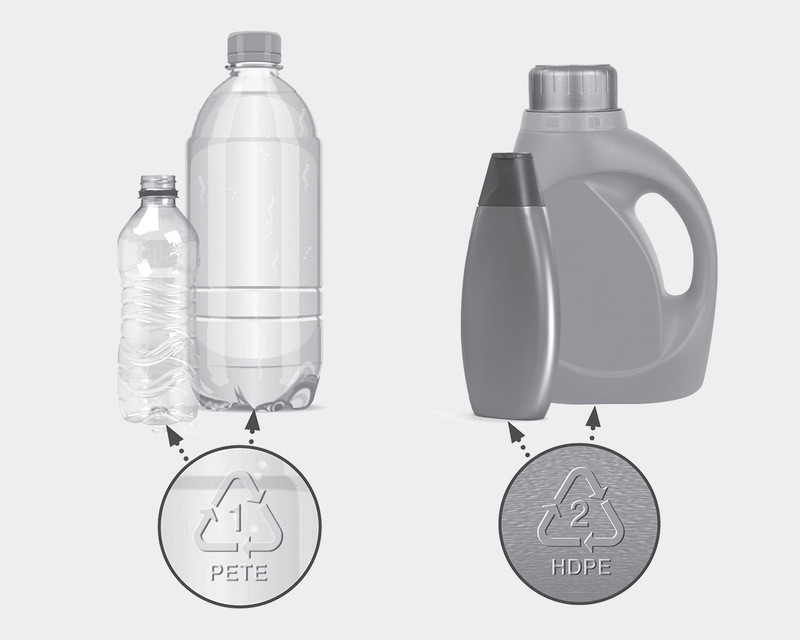 There are actually seven different types of plastic used to make bottles, jugs, bags and other kinds of packaging. But only two of them — #1 and #2 — are able to be shipped off for recycling right now. And only if they are collected as clean, separate materials. If they’re mixed with anything else, they’ll be rejected for recycling. In our curbside recycling program, when we collect commingled recyclables in carts, we can’t see the number on the bottom of the plastic bottle or jug that tells us if it’s recyclable. Our drivers can only see what they’re dumping via a small camera mounted on the truck. The most we can make out is the shape — which is why the only plastic containers we can accept at the curb are milk jugs. They are easy to identify and are always #2 plastic. Remember, these select plastic bottles and jugs can ONLY be dropped off at the Transfer Station, NOT dropped in your curbside recycling cart.